Miles Nelson Elliott, age 71, of Mt. 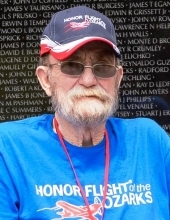 Vernon, Missouri, passed away at 8:53 p.m. on Thursday, January 31, 2019, at the Mercy Hospital in Springfield, Missouri. He was born January 28, 1948, in Flint, Michigan, the son of Johnnie and Lueda (Rinker) Elliott. Miles was a 1966 graduate of Marionville High School, in Marionville, Missouri. He was a United States Army Veteran serving during the Vietnam Era and was a truck driver. He was an awesome papa and loved to spend time with his grandkids and was a member of the Chesapeake Baptist Church. On March 3, 1995, he married Violett Harlow in Chesapeake, Missouri. Miles is survived by his wife of 23 years, Violet; one daughter, Amber Cox and her husband, Todd, of Hurley, Missouri; one son, Miles Elliott of Monett, Missouri; one step-daughter, Katherine Brooks and her husband, Chris, of Sarcoxie, Missouri; two step-sons, John Guenther, of Verona, Missouri and Todd Guenther and his wife, Michelle, of Verona; eleven grandchildren, Coby, Dylan, Keiana, Justin, Kelson, Shane, Katie, Lauren, Paxton, Kryn and Phoenix; five great-grandchildren; one sister, Connie Harmon and her husband, Lee, of Greenfield, Missouri; one brother, Everett Elliott and his wife, Becky, of Marionville, Missouri and several nieces and nephews. His parents, Johnnie and Lueda, and his first wife, Cathy Elliott, preceded him in death. A funeral service, under the direction of the Fossett-Mosher Funeral Home, in Mt. Vernon, will be held at 10:00 a.m. on Monday, February 4, 2019, at the Chesapeake Baptist Church with burial to follow at the Campground Cemetery. Visitation will be held from 2:00-4:00 p.m. on Sunday, February 3, 2019, at the church. Memorial donations may be made payable to St. Jude Children’s Research Hospital, in care of the funeral home. To plant a tree in memory of Miles Nelson Elliott, please visit our Tribute Store. Campground Cemetery, Mt. Vernon, MO. Memorials may be made payable to St. Jude's Children's Hospital, in care of the funeral home. "Email Address" would like to share the life celebration of Miles Nelson Elliott. Click on the "link" to go to share a favorite memory or leave a condolence message for the family.